Blackstone Audiobooks, 2004. Book originally published in 1926. 3 hours on 3 cassettes. I've already reviewed Winnie-the-Pooh at length and said how special it is to me. Although part of the specialness is that I fell in love with my husband while reading Winnie-the-Pooh together, I find that the book is still just as special even though my husband has now left me. Winnie-the-Pooh has been part of my life much longer than he has. I have checked out several cassettes from the library that I want to listen to before we end up getting rid of all our cassettes, and Winnie-the-Pooh is one. (Though the same version is now available on CD.) It was the perfect book to listen to while my son and I were making lots of trips back and forth while toting our possessions for a move across town. I was appalled to learn that my teenage son doesn't remember most of the stories. Surely I had read them to him enough times? He learned to write his name P-O-O-H, for goodness' sake! Anyway, we thoroughly enjoyed listening to and laughing over them in the middle of the serious business of moving. We will definitely have to do some Pooh readalouds together just as soon as we find the box where my copy is hiding. 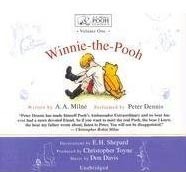 You can't ask for a better family listening experience than this version of Winnie-the-Pooh. And I don't care if your family is all adults or includes toddlers. Those who are only familiar with the Disney versions may not realize the wonderful subtle humor and charm of the original books. It's hard to imagine anyone of any age not enjoying these stories.